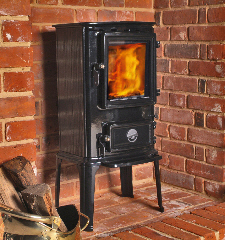 The Kosi 6304 is a compact Danish designed and manufactured Multi Fuel stove made from solid cast iron. 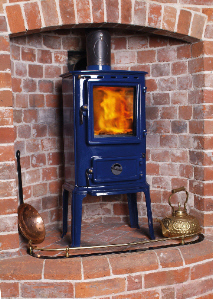 It has an output capability of up to 5KW when burning wood, 7KW with smokeless fuel. The Kosi has a top or rear flue option and incorporates a reciprocating grate with ash drawer together with tight closing doors. The combined airwash and preheated air chamber has been carefully developed to improve combustion whilst keeping the glass clean. 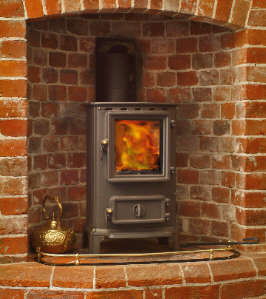 For 2007 the Kosi stove has been further improved with a skamolex lined fire chamber to increase the overall efficiency up to 78%. 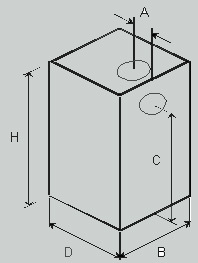 Various options include long leg (250mm), standard leg (100mm) as well as a double sided kosi stove are available. Choose from matt black, enamel blue and enamel gloss black finish. Beautiful engineered stove with high quality and finish.